Spring is still a few weeks away, but here at Rainbow we are gearing up for our busiest time of the year! Baby chicks are in the store, and Rainbow has all the feed and supplies you need to raise your own backyard flock, even chicken houses! Don’t forget you can special order nearly any type of poultry including ducks and geese, and our friendly, trained staff members are happy to answer your questions. You will be enjoying fresh eggs in no time! Also coming right up, fill up your barn during the Spring Alfalfa Hay Booking Sale. Rainbow is negotiating for a great price on Alfalfa (special pricing on other kinds of hay too). The sale begins March 7 and runs until March 12. Just order and pay for your hay during the sale, then pick it up any time before March 31. (Sorry, no delivery available on sale hay.) Watch for more details, including the best price of the season, and load up that barn with quality, three-wire bales of Alfalfa! 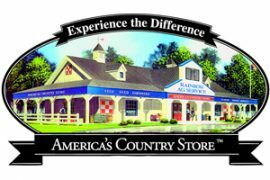 Spring clothing and boots are arriving now in the store. Fun and fashionable jeans, tees, sweatshirts, Men’s Western shirts, work clothes and more – take a peek into the clothing departments to see what’s new, at both Rainbow Ag stores. 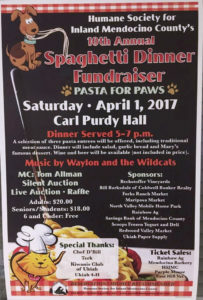 Mark your calendars for April 1 – No Foolin’ – it’s the Humane Society of Inland Mendocino County’s Spaghetti Feed Fundraiser, from 5:00 to 8:00 PM at Carl Purdy Hall, at the Redwood Empire Fairgrounds. With three entrees to choose from being served from 5:00 to 7:00 PM. and desserts you cannot miss, there will also be a live auction with wonderful MC Tom Allman and a silent auction as well. Live music completes the evening, and beer and wine will be available for purchase. The tickets are $20 for adults, $18 for seniors and students and children 6 and under are free! Join in the fun and support the animals at the HSIMC shelter. All funds raised go directly to helping the animals. Tickets are available at HSIMC and Rainbow Ag in Ukiah. View the poster here! February is Pet Dental Health Month and there is still time to save on Greenies at Rainbow Ag. Buy One, Get One 50% Off until February 28. Rainbow is also sharing FREE Greenie treats – ask for your free Greenie treat at the checkout counter during February. 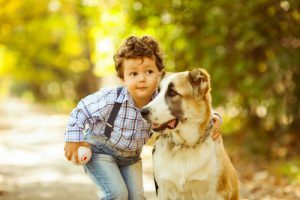 How much do you know about your pet’s dental health? Take this quiz from the American Veterinary Medical Association to learn more! Nothing is more fun that playing with our pets! Whether it is a game of fetch with Fido and his favorite ball, or a feather dancing at the end of a string for Cleo Kitty to chase, doesn’t it always bring a smile? 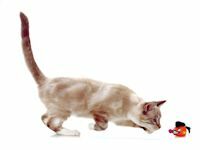 Get a new plaything for your pet, and save 25%, with this month’s Subscriber Coupon – 25% Off Any Pet Toy! Click here to get your coupon. Win a $15.00 Rainbow Gift Card! Enter the Wags Trivia Contest – all correct entries are entered in a random drawing for a Rainbow Gift Card. Last month’s question was a bit tricky, because in certain situations, all of them could need to have their front teeth trimmed! All entries were included in the random drawing, and the winner was Susana from Kelseyville. 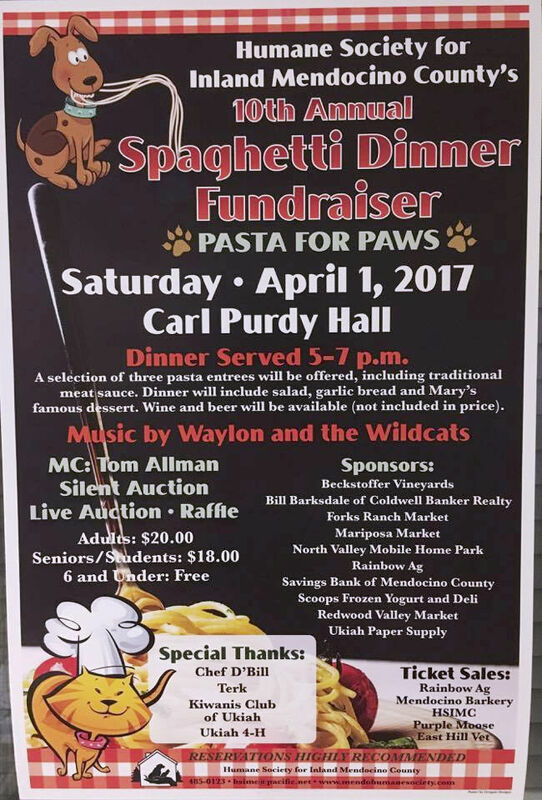 Click here to enter this month’s contest – What will be served at the Humane Society of Inland Mendocino County’s April1st Fundraiser? This entry was posted on Sunday, February 19th, 2017 at 3:05 pm	and is filed under News, Rainbow Wags Newsletter. You can follow any responses to this entry through the RSS 2.0 feed. Both comments and pings are currently closed.